Water could generally be described as the most important of all chemical substances. Its chemical designation is H2O; the water molecule is composed of 2 Hydrogen atoms and 1 Oxygen atom. While it is evaporating from the surface of a lake or the ocean into the atmosphere, we can designate the water vapour H2O. In the atmosphere, clouds will form, and during suitable humidity and temperature, the clouds will deposit water (rain). 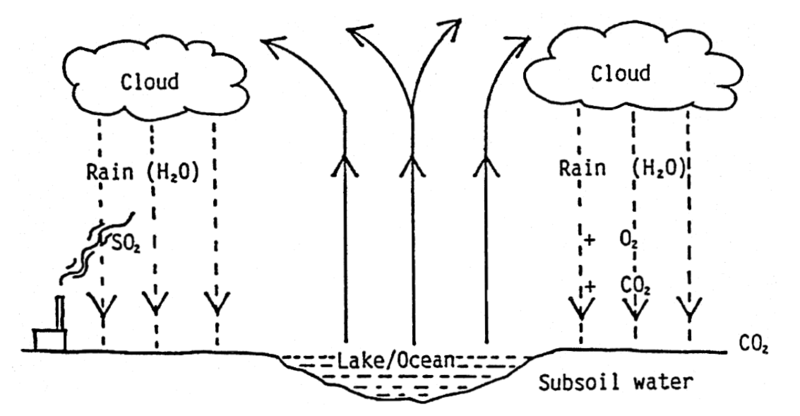 While the rain is falling towards the earth, it absorbs gases which are in the air, e.g. CO2 (Carbon Dioxide), SO2 (Sulphur Dioxide) and O2 (Oxygen). When the water hits the earth, it absorbs additional Carbon Dioxide (from biological degradation). The rainwater which is now slightly acid will dissolve various minerals from the soil. It is necessary to examine some of the basic theories in order to understand the various problems associated with water treatment. While rain is falling through the air, it absorbs gaseous contaminants, e.g. O2 (Oxygen), which solubility in pure water depends on temperature. At 20 °C, 9 mg/l O2 may dissolve, and at 50 °C approx. 5.5 mg O2/l, and at 90 °C approx. 1.5 mg O2/l, and at 100 °C approx. 0.0. mg O2/l, so, the higher the temperature, the less O2 can dissolve in water. Ca(HCO3)2 is called Calcium Bicarbonate. SO2 (Sulphur Dioxide) is an air pollutant which stems from flue gases, so there is usually a high atmospheric content of this gas around industrial areas. CaCO3 + H2SO4 > CaSO4 + H2O + CO2. CaSO4 is called Calcium Sulphate (gypsum). TEMPORARY HARDNESS (Alkaline Hardness) is due to bicarbonates of Calcium and Magnesium which are Alkaline in nature. They are “temporary” because when heated they rapidly break down to form Carbon Dioxide and the corresponding carbonates which deposit as scale. PERMANENT HARDNESS (Non-Alkaline Hardness) is due mainly to Sulphates and Chlorides of Calcium and Magnesium which are acid in nature. They are “permanent” and do not break down, but under certain conditions deposit to form scale of varying hardnesses.